I’m a Canadian author — I write fiction and narrative nonfiction. I’m also a former professional tree planter. I sowed my first seedling when I got a job on a reforestation crew in northern Ontario. I was nineteen years old and an undergraduate at the University of Toronto. Before tree planting, I didn’t know anything about hard physical labour. I arrived in a remote and snowy camp in the boreal forest with half the necessary camping gear and all the wrong clothes. But I was instantly hooked on the tree-planting life — a job most of us grow to love and hate in equal measure. Since those early days, I’ve worked on the Canadian Shield, in the foothills of the Albertan Rockies and in many parts of British Columbia, including the breathtakingly primeval Great Bear Rainforest. Like thousands of planters all over Canada, I’ve left my handiwork in muddy swamps and on high mountaintops, in sandy loam and rocky barrens. I’ve commuted to work in float planes, offshore tugboats, diesel trucks, helicopters, rowboats, ATVs, inflatable dinghies, and amphibious military vehicles. I’ve crossed paths with whales, eagles, dolphins, flocks of migrating cranes, moose, newborn fawns, and grizzlies. In my silvicultural travels, I met all kinds of weird, brilliant, fascinating people. They’re still some of my closest friends. In seventeen seasons I planted more than a million trees. I don’t do it for a living any more, but for some strange reason it took me a whole book to explain, I miss it every day. 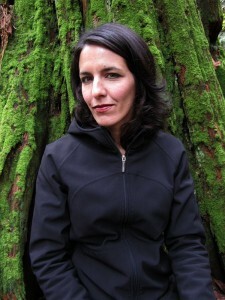 Charlotte Gill is the author of Eating Dirt, a tree-planting memoir nominated for the Hilary Weston Writers’ Trust Prize, the Charles Taylor Prize, and two B.C. Book Prizes. It was the 2012 winner of the B.C. National Award for Canadian Non-Fiction. Her previous book, Ladykiller, was a finalist for the Governor General’s Literary Award and winner of the B.C. Book Prize for fiction. Her work has appeared in Best Canadian Stories, The Journey Prize Stories, and many magazines. She is currently faculty in creative writing at the University of British Columbia and in the MFA program in Creative Nonfiction at King’s College. She lives on the Sunshine Coast of British Columbia, Canada.